Probably Nepal is one of the world’s most diverse countries in terms of nature and culture. You will see thousands years of old Temples, Monasteries, heritage sites which are enlisted in UNESCO. See and experience the lively deep rooted culture of Nepal and its people. The only holy place on earth for spirituality where you can learn Buddhism and Hinduism in depth. Lumbini is a must visit place for Buddhist all over the world. Pashupatinath temple is a dedicated to lord Shiva and it is the holy place of Hindu. Meeting the Living Goddess-Kumari is an unique spiritual experience. 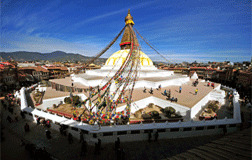 Helicopter Tour to Everest and breakfast at world's highest altitude hotel with champagne and viewing Mt. Everest from very close at 5500m or experience one hour Everest Flight from Kathmandu. Pokhara-city of lakes, mountains, adventure activities is considered as a one of the most beautiful cities in the world. Chitwan National Park for Jeep safari in dense forest, to see one horn rhino, Royal Bengal tiger and enjoy the culture of Ethinic people Tharu. Trekking: Nepal has been renowned for the ultimate destination of Trekking. Everest, Langtang, Annapurna, Manaslu are the top region for trekking in Nepal. There are so many other trekking trails that can be done from single day to more than 3 weeks. If you are Trekking/Hiking enthusiast then you shouldn’t miss these regions for trekking. 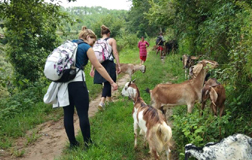 If you want to confront challenge learning and adventure -participate in the most adventurous activities like Mountain Biking and Motorcycling trip in Nepal. Nepal has the best off-road and valleys for Mountain biking and Motorcycling. 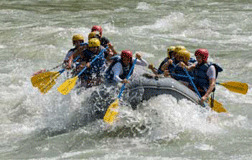 Enjoy adventurous activities like Rafting and Kayaking, Bungy Jumping, Paragliding and Ultralight, Rock Climbing, Canyoning, Everest Marathon, etc. Try Nepali Food MO:MO and take part in local festivals as a local.